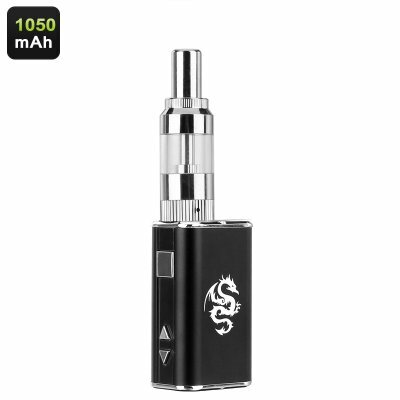 Successfully Added 10Watt Vape Mod Kit - 1050mAh Battery, 5-10 Wattage Range, 1.0-2.0 Ohm Resistance, Temperature Control (Black) to your Shopping Cart. For all beginning vapers out there, this compact and affordable vape mod is the perfect starter’s kit that brings along all that’s needed to leave behind the harmful world of tobacco cigarettes and enter the world of electronic cigarettes. Featuring a compact and light weight design, this e-cigarette efficiently fits in your pocket and can be carried along at any time. Crafted out of stylish aluminum alloy, this vape mod kit holds an extremely durable and stylish design that does not only look good but also can take a hit without you needing to worry about damaging your device. An extraordinary dragon logo that has been printed on this compact e-cig changes color when exposed to high temperatures – adding an extra fun little feature to your vapor as its logo will change and an extraordinary visual effect will show while you’re engaging in your upcoming and relaxing vaping sessions. With a maximum output of 10W, this starter’s e-cigarette brings along numerous of possibilities for you to enjoy all the benefits that e-cigs have to offer. Being capable of resisting up to 2-ohm, this compact electronic cigarette is able to handle quite some Wattage. From now on you’ll be able to enjoy your vaping to the absolute most and impress all those standing around you as, with this little vapor at hand, you’ll be able to produce extra large vaping clouds while enjoying the flavorsome experience of all your favorite e-liquids. Featuring a tiny LED display, you will be constantly up to date about the current settings of your e-cigarette. Not only will you be able to adjust its Wattage, you’ll additionally have the possibility to manually control the temperature – allowing you to adjust your vaping experience to your exact liking. Simply adjust your settings by using the buttons found on your vape mod and you’ll be able to efficiently control all settings, ensuring that you can take the absolute most out of this vape mod kit as it can be exactly adjusted to your personal vaping demands and current mood at any given moment. This beautiful and compact vape mod is ready to be used straight out of the box. Simply assemble the parts and pour in your favorite taste of vaping liquid and you’ll be ready to enjoy the delicious taste along with all the health benefits that electronic cigarettes hold over ordinary tobacco cigarettes. By packing a large 1050mAh battery this E-cig provides you with hours’ worth of continuous usage time during which you can engage in numerous relaxing and tasteful vaping sessions without ever needing to worry about your battery life. With this starter’s vape mod at hand, you’ll be able to enjoy countless health benefits, save money, and enjoy countless of delicious tastes – making it the perfect accessory that helps you get rid of your current tobacco smoking habit.